St. Scholastica’s College maintains strong linkages and partnership with institutions here and abroad. In Metro Manila, the collaboration between and among colleges and universities along Taft Avenue started in 1975 when the South Manila Educational Consortium (SMEC) was founded. In 2001, three top women’s colleges in Metro Manila joined forces and launched the Consortium of Women’s Colleges (CWC). The partnership is anchored on the thrust of achieving more efficiently common educational goals and objectives as against duplication of efforts and competitiveness in the field of education. The CWC puts premium on the principle of interconnectedness for the maximization of resources, both human and material. 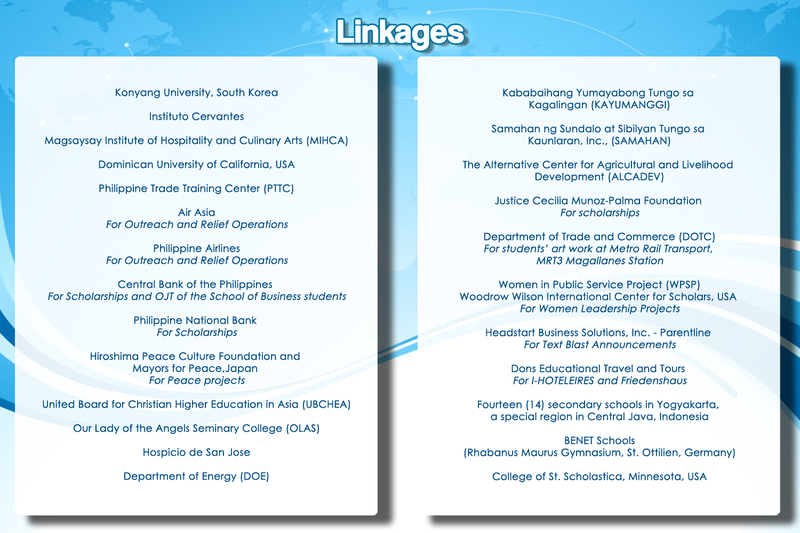 Areas of cooperation are reflected in various consortium activities and programs spearheaded by the presidents and top administrators of each institution. Working committees are generally on the areas of academics, admissions and registration, administrative support, campus ministry, guidance, finance, information technology, library, research, social action and student affairs.